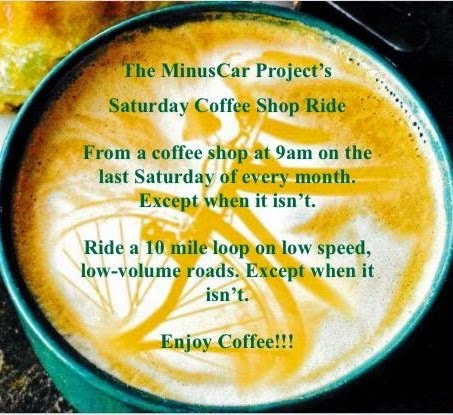 The next Saturday Coffee Shop Ride will be Saturday September 26. 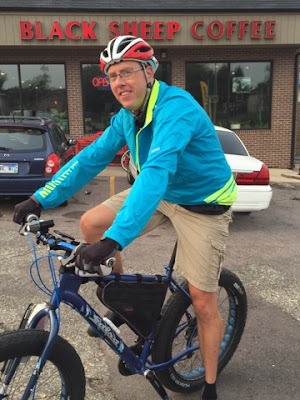 We'll depart at 9am from Dunn Brothers Coffee near the intersection of Arrowhead Parkway and Highline Ave. It's a long way out there so plan plenty of travel time. I had a blast today. Partly because riding bikes is fun. Partly because I spent from 8am to 2:30pm on my bike or on bike related activities. Partly because the Pugsley has come back into my bike riding favor. 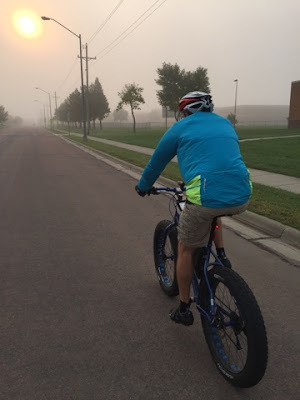 Today began with a ride into the foggy sunrise with riding buddy Clint. By the time we reached the starting place for the Saturday Coffee Shop Ride I could see the front of his back. 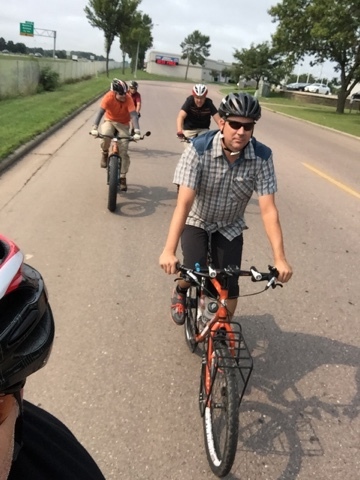 Clint and I departed Black Sheep Coffee on schedule and when I held up my phone for a bike riding selfie I discovered we were being followed! Gasp. So I took a picture of them in case they were up to no good. I decided on the way to the ride to alter our route so that we could see this giant pin cushion. 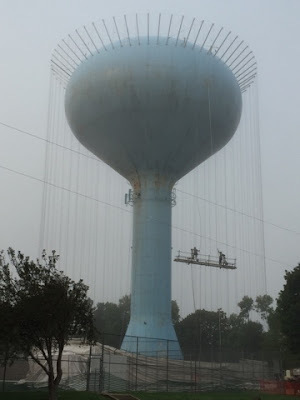 This watertower is soon going to be painted. Part of the external structure is for scaffolding as seen demonstrated in the photo. Not demonstrated and on the ground is a giant cover that will be pulled up to conceal the tower while it's being painted. I assume this protects neighboring homes from turning blue however I HOPE that they'll secretly paint something revolutionary. Back in the good old days this water tower had a pentagram and RUSH painted on it. There was also an ostensibly abandoned garage nearby where I assumed satanic rituals took place. I've grown up a lot since then. I suppose it's just as likely to be turned into a giant statue of T Denny Sanford. Along the way I was able to line up the riders for a group photo. Isn't that a fine looking bunch? I think so! 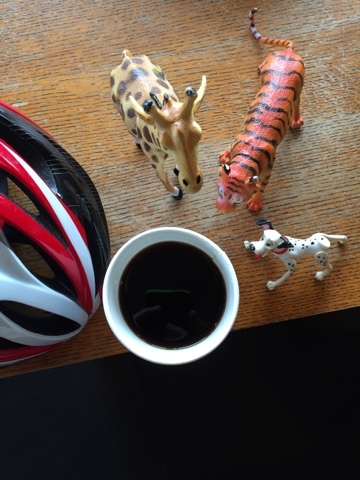 After 10 miles we returned to Black Sheep Coffee where I ordered a cup of coffee and drew the interest of a giraffe, tiger and a dalmatian. The tiger had bloody paws and teeth which I thought would maybe cause the nearby and rather pristine lion to take exception. Nevertheless the giraffe, being tall enough to actually reach the coffee was my only real source of concern. Upon our second departure of Black Sheep Coffee there remained a smaller group of rather stalwart pursuers. Turns out they got wind of the possibility of tacos. 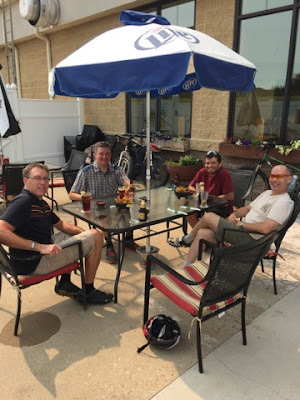 Our next order of business was to pre-ride the route for the September 17th Taco Ride. We arrived at Sertoma Park and in short order were on our wandering, mis-directed, round-about way to the Louise Ave Puerta Vallarta. Where we indeed enjoyed lunch. 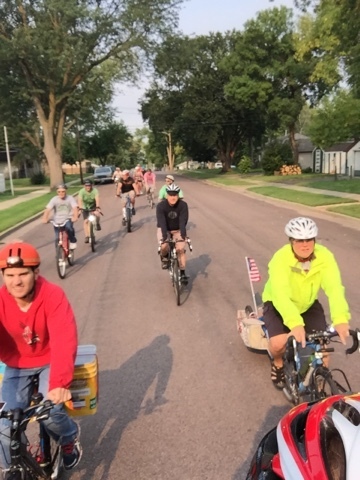 We closed the Taco Ride loop back at Sertoma Park before heading off on the long way home. Clint and I ended a very satisfying day with 40 FAT miles. 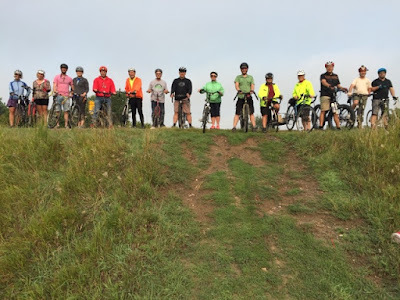 The next Saturday Coffee Shop Ride will be August 29. It will depart from Black Sheep Coffee, 1007 W 11th St. 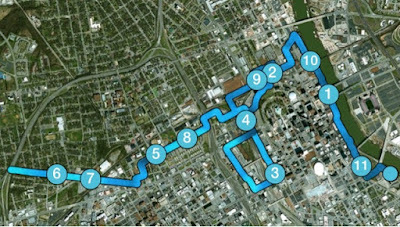 The route will explore the 10th St sharrow, the best way to access the events center by bike, the Russell/West bike lanes and the Main Street road diet. The ride leaves at 9am. The loop is 10 miles and is as always weather adjustable. There are general expectations of the Saturday Coffee Shop Rides. Faster riders may find the slowish speed of this ride mentally taxing. The first, the premiere, the initial, the beginning of what could be a beautiful thing. A Taco Ride. 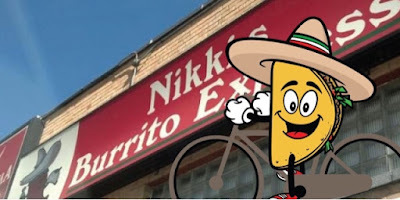 It's a ride with the end point being a place where tacos are consumed. Good tacos, made by people who care about the sort of impression they give when they serve tacos. Tacos served in a way that respects and expresses the important history of tacos. Tacos from people whose very livelihood depends upon serving excellent tacos. 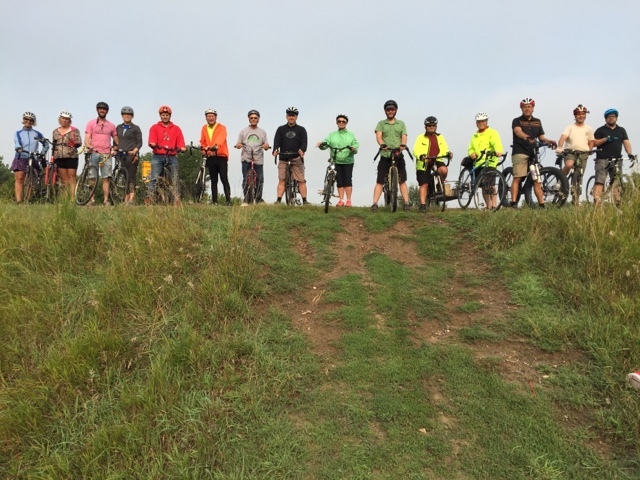 On August 20 at 6:30pm a bunch of people from a bunch of different rider groups including The MinusCar Project will meet at Riverdale Park. The ride will take an hour to find its way to Nikki's Burrito Express for...tacos. Need I say it again. Ok. Tacos. There's lots of good buzz about this ride. We're expecting a very strong rider showing. I think the people who like The MinusCar Project will like this ride. Taco Ride. August 20. 6:30pm. I got up early to ride the other, in-city direction on the Music City Bikeway. 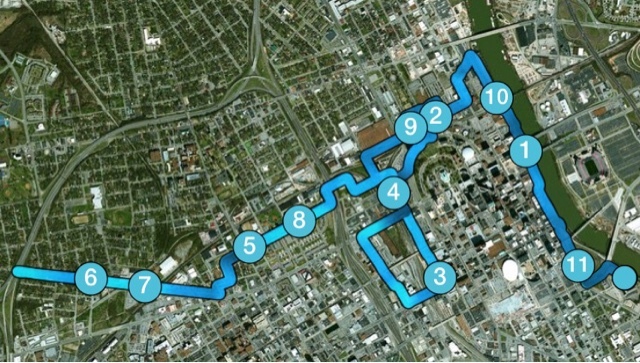 Construction, way-finding problems and time restraints made the ride not wholly satisfactory. But it counted. After a 20 minute walk I settled in for 5 hours of performances by 18 acts. Highlights for me were the Ronnie Cole Trio, Ronny Cox and Blue Jupiter. Ronny Cox is a good example of what I like about our artists. Remember Beverly Hills Cop, Total Recall, Deliverance? Well he can sing and write songs too. Community concert associations give people like this places to perform and entertain. Venues and audiences. 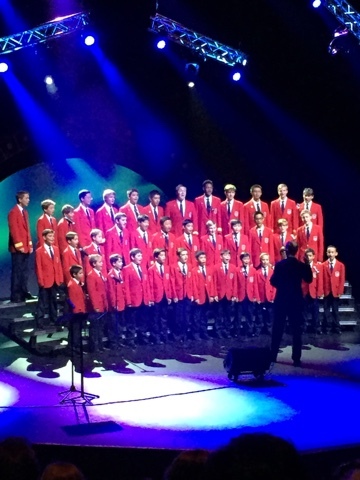 Here is a photo of the All-American Boys Chorus. 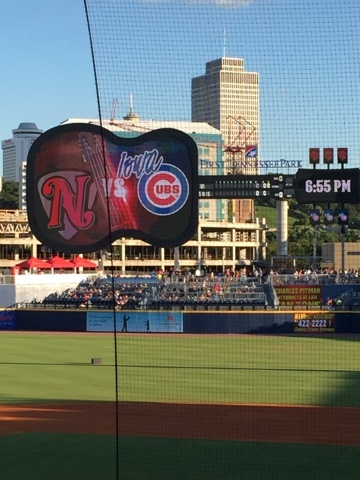 After another 20 minute walk I arrived at First Tennessee Park for Nashville Sounds/Iowa Cubs baseball. I fullfilled my BBQ goal here as well with some ballpark brisket. And...both Iowa and Chicago CUBS WIN! I grabbed a Nashville B-cycle outside the park and rode it (night ride!) the 2 miles back to my lodging. 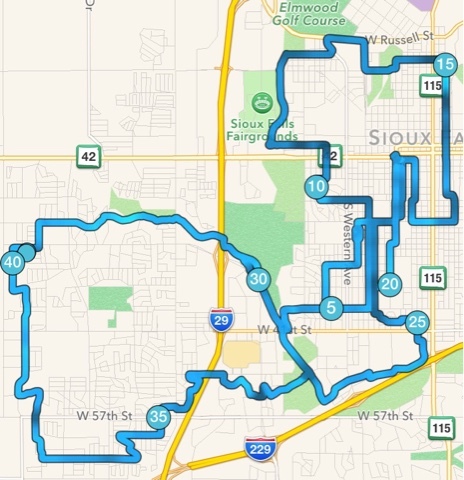 This route I providentially practiced on the morning's ride. Upon arrival I observed Eric Church remained in residency at the Ascend Amplitheater. My lodging. Not a nighttime photo. 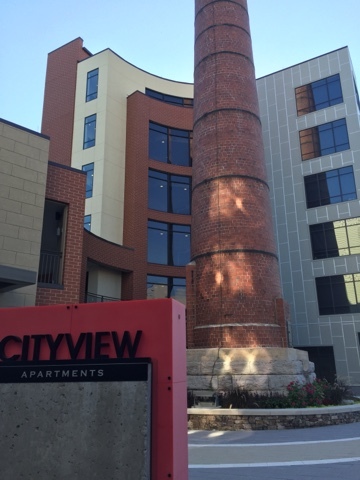 The smokestack makes me wonder what's in the basement.